If you've got the perfect career or business, congratulations. But if you are even a little bit uncertain that your current gig is the right one, it is time to start thinking about your next move. In the new world of work and business, it's the only move that matters, according to Jenny Blake, author of Pivot. What's next? is a question we all have to ask and answer more frequently in an every changing and increasingly competitive business world. But how do you evaluate options and move forward without getting stuck? Author Jenny Blake's solution: It's about small steps, not big leaps—and the answer is already right under your feet. This book will teach you how to pivot from a base of your existing strengths. Pivoting is a crucial strategy for Silicon Valley tech companies and startups. Jenny Blake, a former training and career development specialist at Google who now runs her own company as a career and business consultant and speaker, shows how pivoting can also be a successful strategy for individuals looking to make changes in their work lives, whether within their role, organization or business, or setting their sights on bigger shifts. When you pivot, you double down on your existing strengths and interests to move in a new, related direction, instead of looking so far outside of yourself for answers that you skip over your hard-won expertise and experience. It empowers you to navigate changes with flexibility and strength—now and throughout your entire career. Much like the lean business principles that took Silicon Valley by storm, pivoting is the crucial skill you need to stay agile, whether or not you are actively looking for a new position. Double down on existing strengths, interests, and experiences. Identify what is working best and where you want to end up, then start to bridge the gap between two. Scan for opportunities and identify new skills without falling prey to analysis paralysis or compare and despair. Explore options by leveraging the network and experience you already have. Run small experiments to determine next steps. Do side projects to test ideas for your next move, taking the pressure off having the entire answer up front. Take smart risks to launch with confidence in a new direction. Set benchmarks to decide when the time is right to go all-in on your new direction. Your choice, today and in the future, is to pivot or get pivoted. Pivoting is a mindset and a skill set, and you can get better at both. In hindsight I we my entire career as a series of pivots, within companies and also on my own, where I have made several smaller pivots in my business since. When I left Google, I pivoted to launch my own career-consulting and speaking business. I shifted the context of my work environment, but not the content, given that I applied a similar set of strengths and activities. In basketball, a pivot refers to a player keeping one foot firmly in place whilst moving the other in any direction to explore passing options. Much like a basketball player, successful pivots start by planting your feet, setting a strong foundation, then scanning the court for opportunities, staying rooted whilst exploring options. Jenny Blake is an author, career and business strategist and international speaker who helps smart people organize their brain, move beyond burnout, and build sustainable, dynamic careers they love. 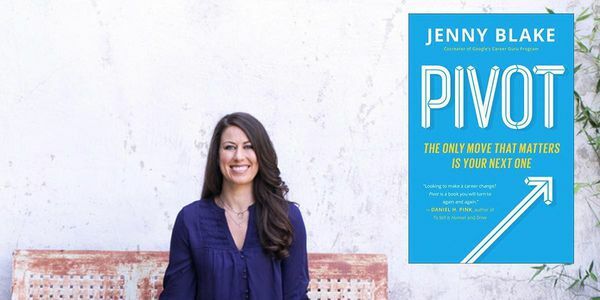 With two years at a technology start-up as the first employee, five years at Google on the Training and Career Development teams, and over five years of running her own business, Jenny combines her love of technology with her superpower of simplifying complexity to help clients pivot their career or business. Jenny created her first website, LifeAfterCollege.org, in 2005, then released a book of the same name in 2011 that was featured in Target’s 2012 graduation display. She has been featured on Forbes.com, US News & World Report, Real Simple magazine, and has spoken at major universities and top companies such as Columbia, TEDxCMU, Yale, Parsons, UCLA, Google, Intuit, KPMG and Best Buy. Today you can find her at www.JennyBlake.me, where she explores systems at the intersection of mind, body and business. Jenny is based in New York City, where she imagines she's starring in a movie whenever she walks through its crowded streets. Listen and subscribe to the Pivot Podcast and follow her on Twitter @jenny_blake.